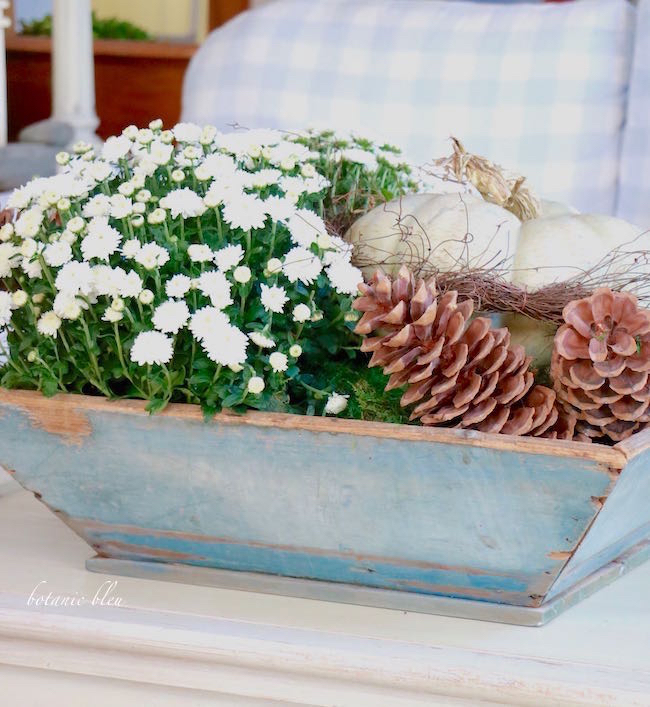 You may have a natural talent for knowing exactly how to style a large box with flowers, pine cones, pumpkins, and wild wispy vines. Or, you may have taken floral courses or weekend workshops to develop your talent. 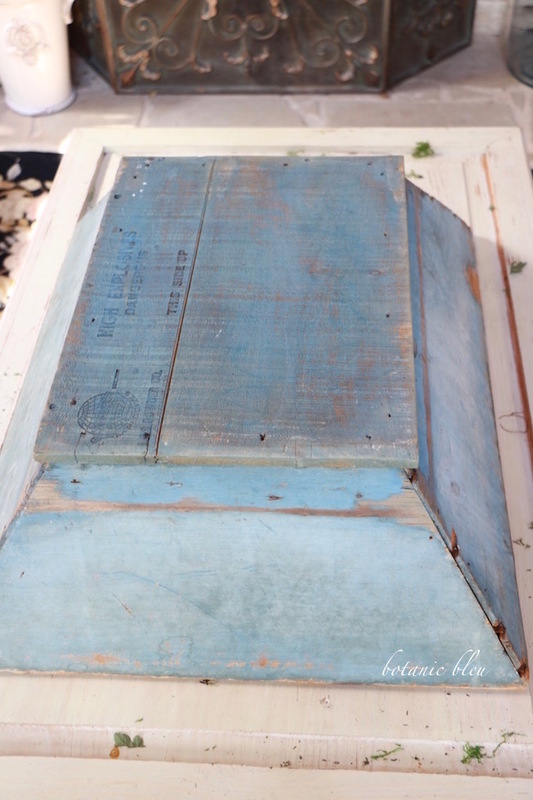 I confess I did not have a natural talent and did not take a course to develop a talent for styling a rustic blue box. 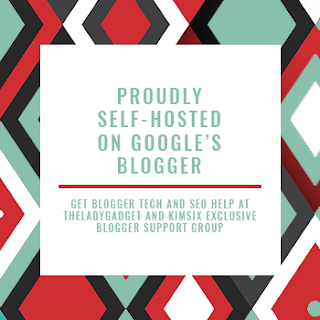 No, I developed my skills by reading gracious fellow bloggers who shared their tips and secrets for styling arrangements on their blogs, and some even have shown step-by-step instructions. Plus, I have a very talented sister who is a professional florist who gives me pointers periodically. 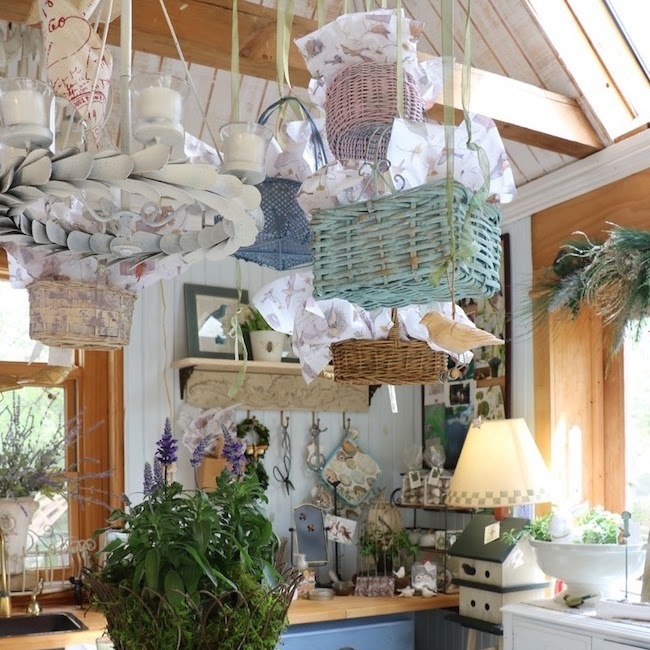 She did take floral courses to become a florist. Be forewarned. All of my how-to tips and instructions are my own and are not meant to be professional advice. But, I must say I am pleased that I was able to put this arrangement together all by myself. Now, it's time I pay my knowledge forward and share it with you. 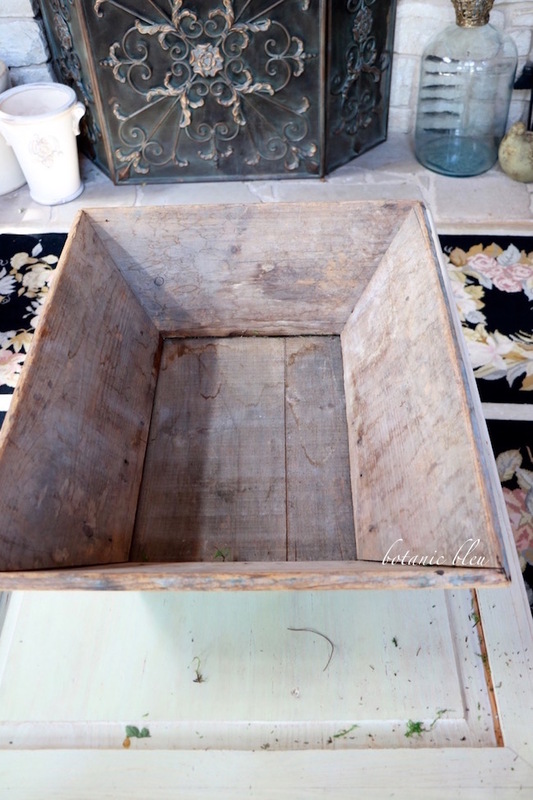 Start with a great rustic box or dough bowl with a lot of patina. 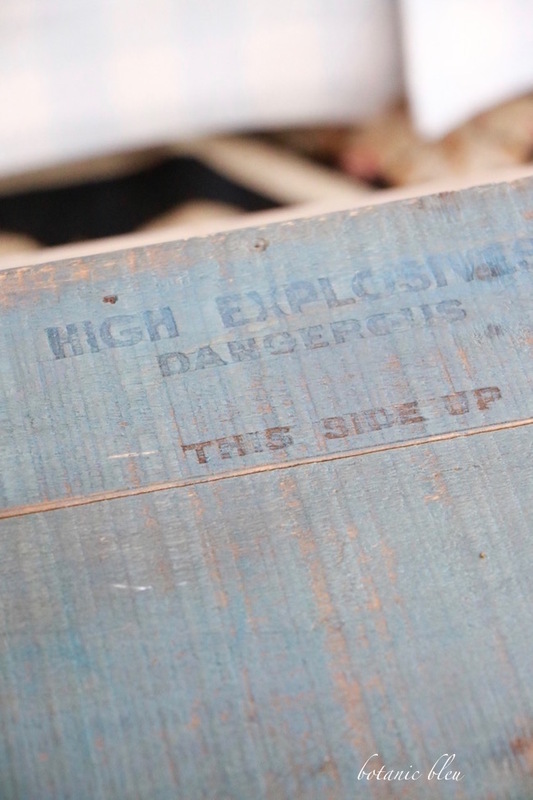 This box was made from an old explosives box before I got it. A box with slanted sides helps what is inside to be more visible than when inside a box with straight sides. The rustic blue box has some water stains. 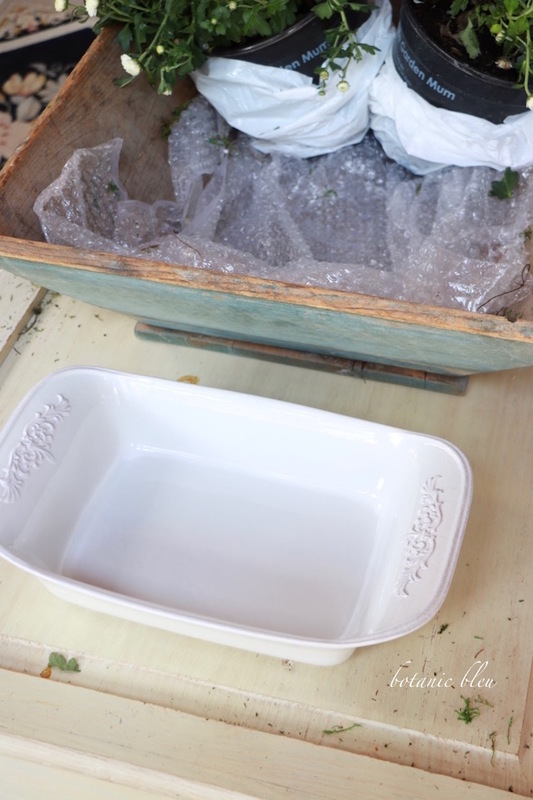 To prevent stains or water damage to a box, line the box with a large sheet of plastic. 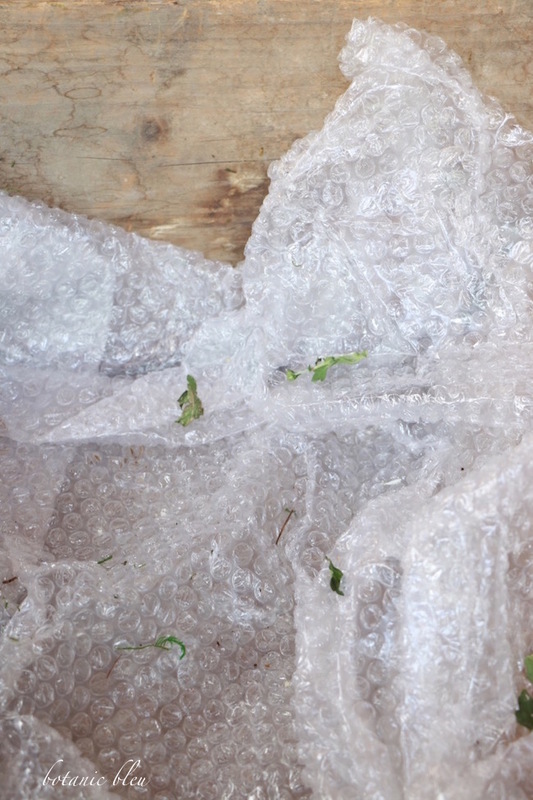 Bubble plastic wrap works well as a liner. 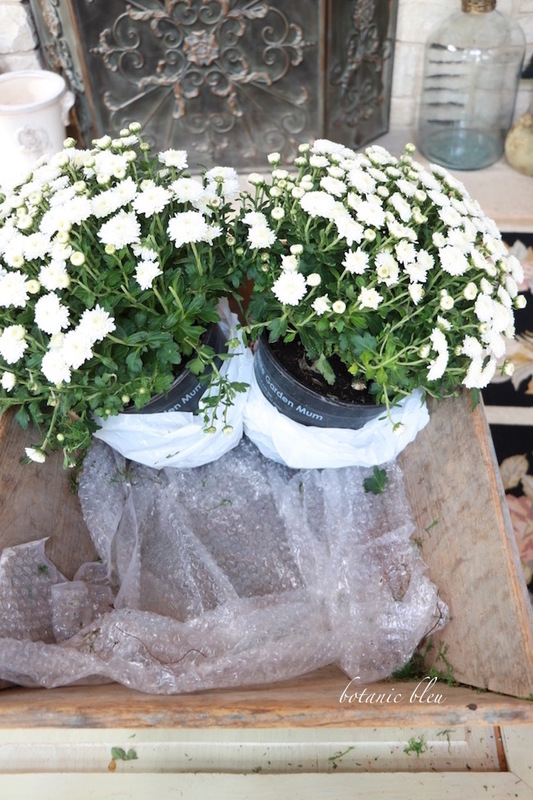 Place the two chrysanthemum pots into plastic bags. Check the bags to make sure the bags do not have holes in them. 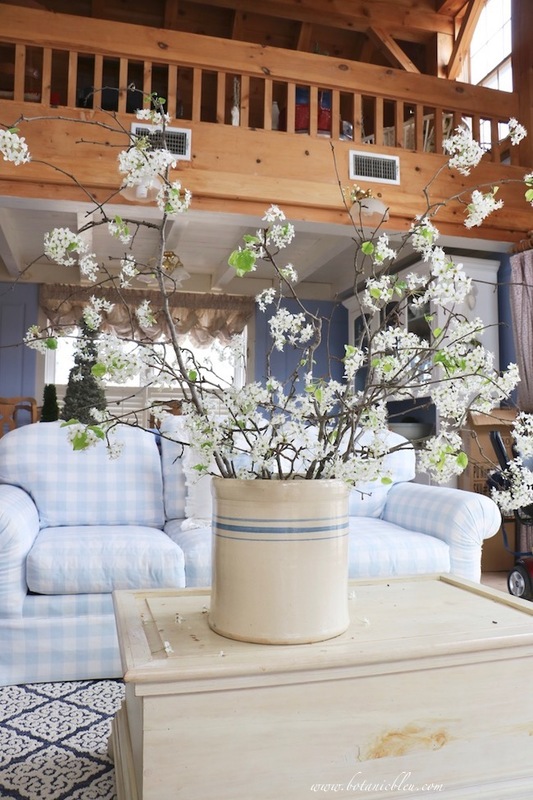 Using plastic bags will allow the arrangement to last several days in the house since the flowers can be watered. Lean the two potted mums against the slanted sides of the box. The flowers will drape over the sides of the box, and the flowers will help hide the pots inside the box. 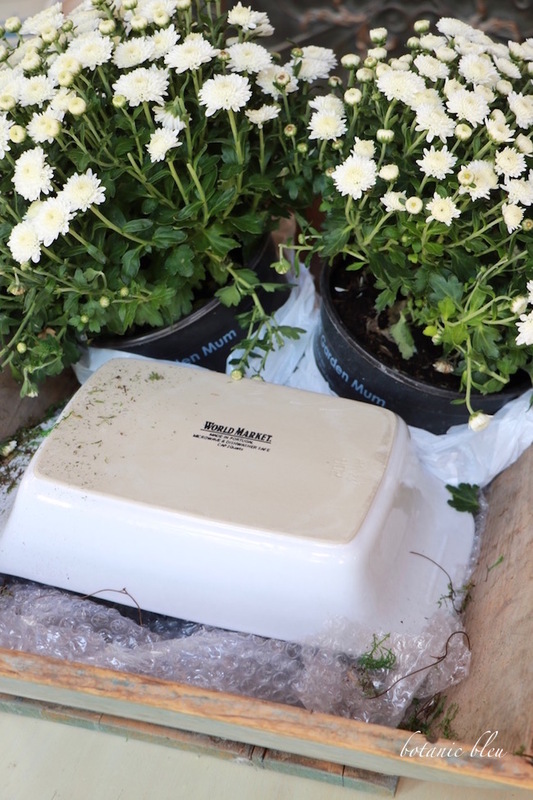 If the flower pots are placed vertically, there will be a gap between the slanted side of the box and the pots making the pots visible. 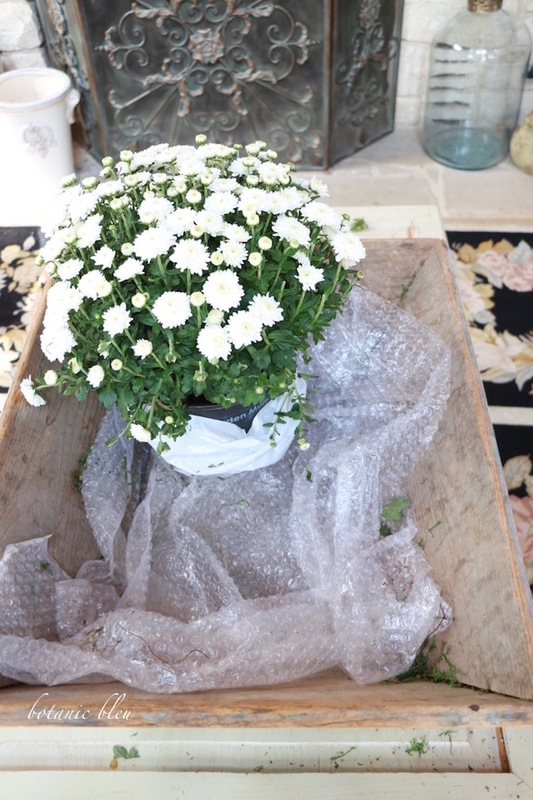 Chooses a shallow and narrow bowl that fits inside the box between the potted mums and the other end of the box. 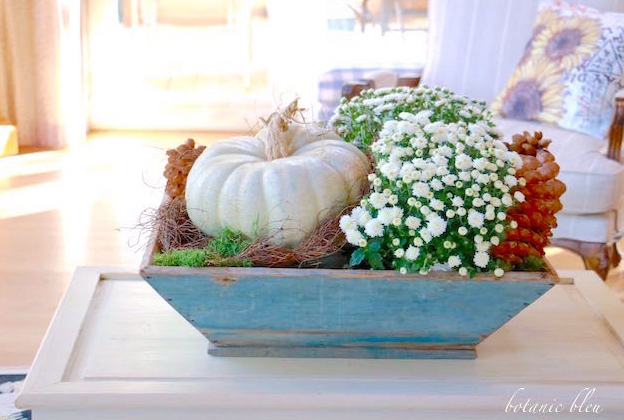 Turn the bowl upside down to serve as a solid platform for the large pumpkin. There is still a gap between the bowl and the end of the box. That's where some of the large sugar pinecones go. 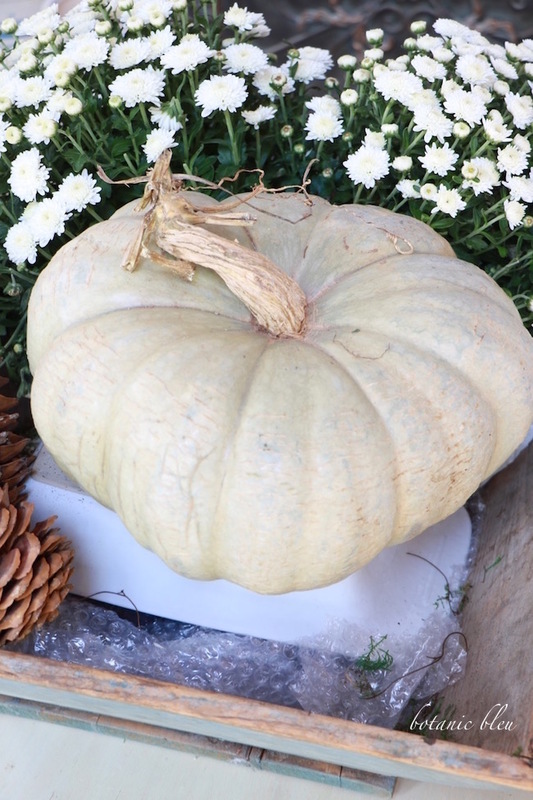 Use a pumpkin with a diameter about the same as the width of the box, but make sure the pumpkin fits inside the box. 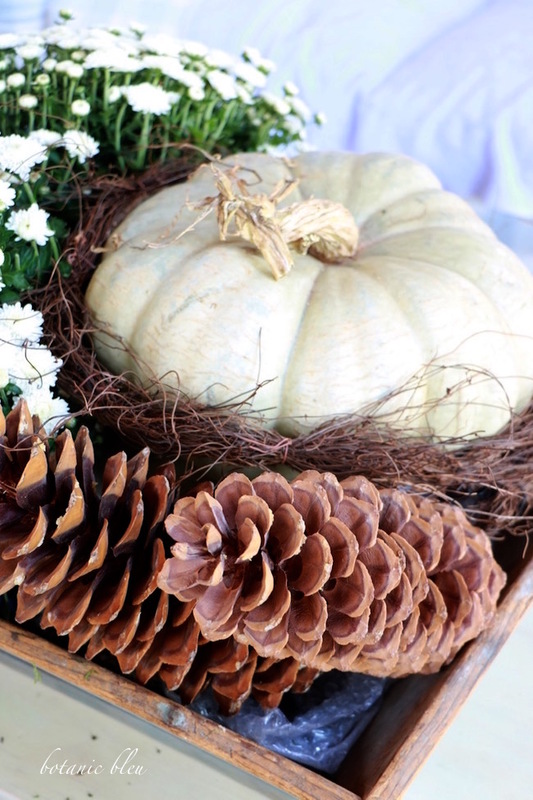 Gaps between the pumpkin and box will be filled with the unruly wild vine and other natural items like pinecones. 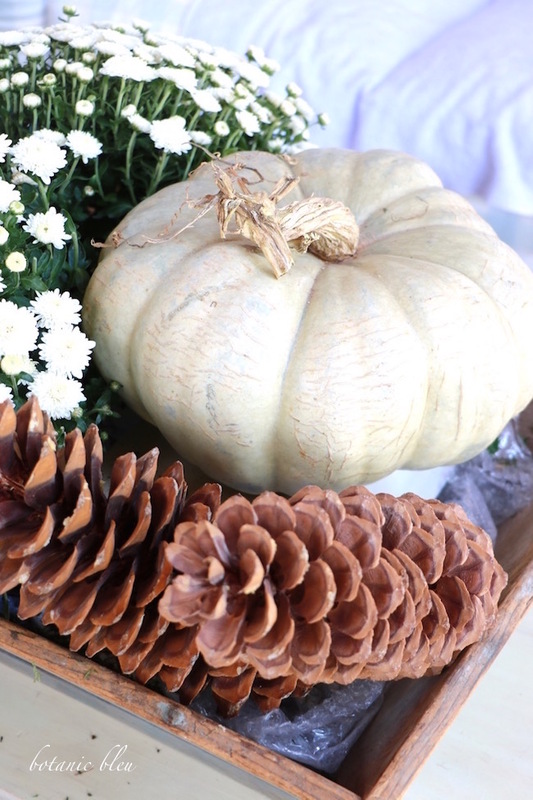 Place two large sugar pinecones around the pumpkin. Overlap them the same direction for optimum coverage. 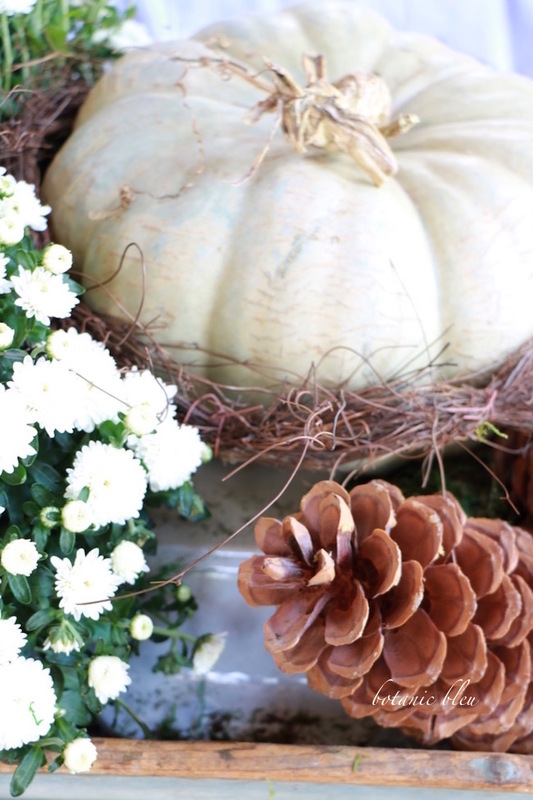 Use the biggest pinecones possible to balance the arrangement visually with the large pumpkin and large pots of mums. Sugar pinecones can often be found online. 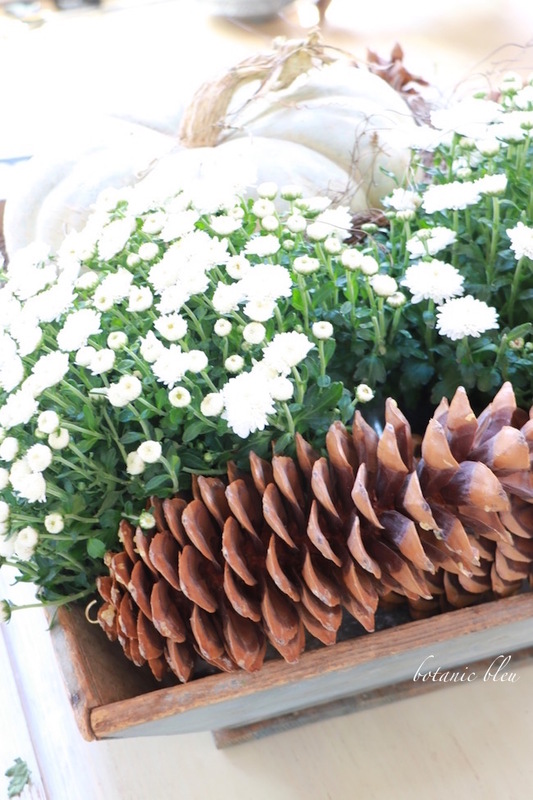 Place the other two sugar pinecones at the other end of box between the mums and box end. Once again overlap them the same direction. 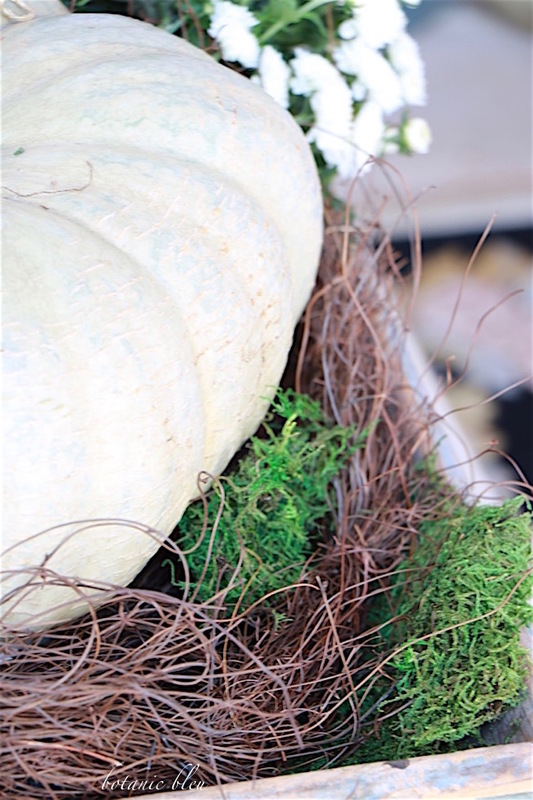 Wind the unruly vine garland around the pumpkin base, nestling the vine between the pumpkin and pinecones. A grapevine wreath can be dismantled and used in place of the vine garland. The gaps between the pinecones and the box sides will be filled with moss in the final step. Use preserved sheet moss to fill any gaps all around the arrangement to hide the plastic liner, bowl, mum pots, and open spaces. Large bags of preserved sheet moss can be found at Michaels and Hobby Lobby. A large grocery store chain in my area also carries sheet moss in its floral department. Since moss is long-lasting and can be re-used, it is worthwhile to keep a bag or two on hand for projects like this. Watch Michaels and Hobby Lobby for their periodic sales and coupons. Do you see the stray piece of plastic visible under the white mums? Easy fix. Just push the plastic below the flowers and add more moss. When photographing how-to pictures of arrangements, take the photos as you dismantle the arrangement, one step at a time. 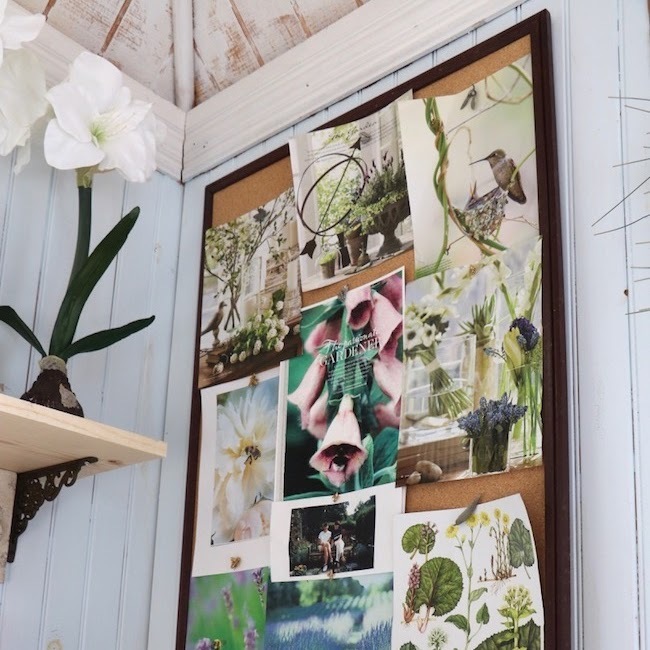 This allows arranging and rearranging the box until the final product without having to take photos that may not show the end results. Once the arrangement is completed, the photos will go much faster by taking them as the arrangement is taken apart. 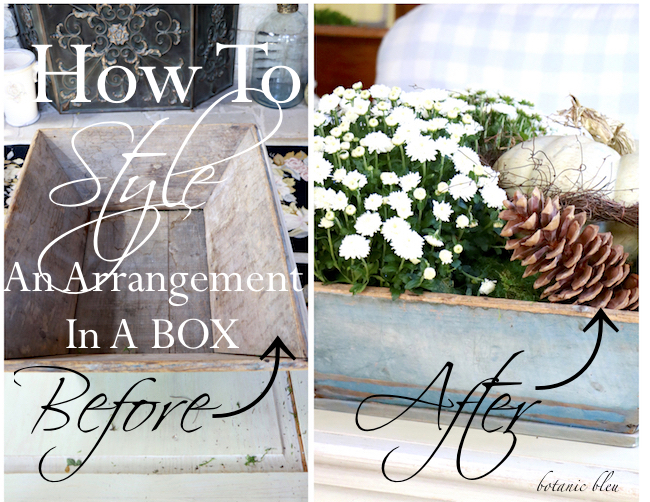 Remember to pin this photo so you can find these step-by-step instructions whenever you want to review how to style an arrangement in a box. One of the easiest ways to add a touch of Fall is with pillows. One lucky Botanic Bleu reader will win a pillow cover of her choice from Elliott-Heath Designs. See Fall French Sunflowers to enter. 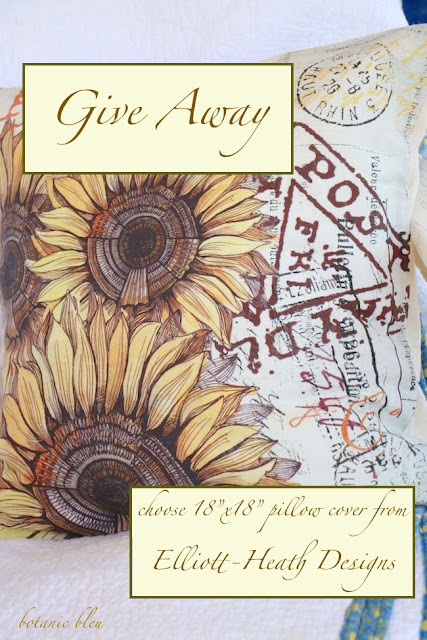 The giveaway continues until November 6, 2016. Bonne Chance! 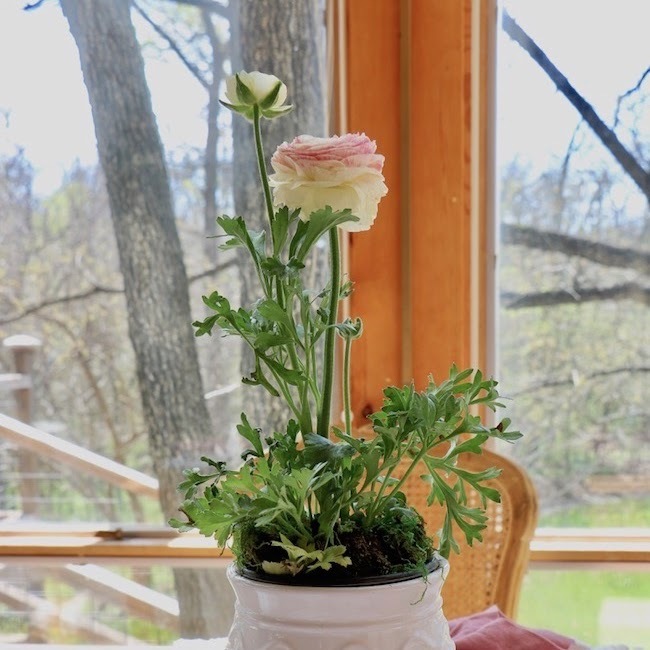 Now that you know the secrets for creating an arrangement in a box, I would love to see your arrangement. 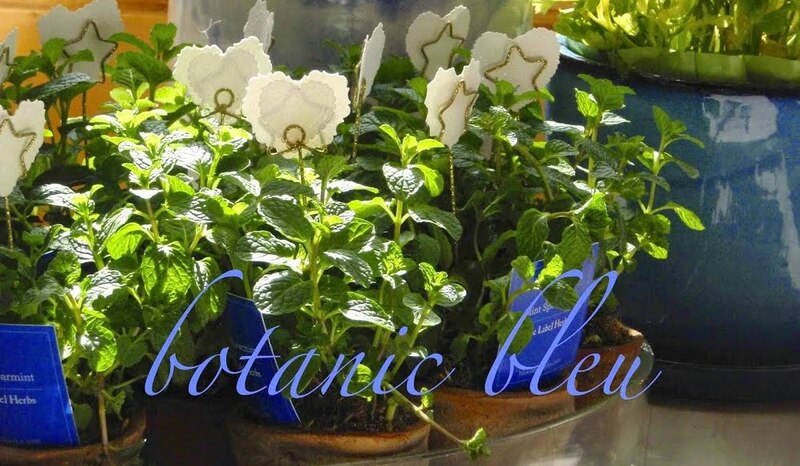 Link a photo from your blog, Instagram, Pinterest, or Facebook to Monday Social that goes live each Sunday at 4:00 p.m. right here at Botanic Bleu. Love how you styled it. I never would have thought of taking the photos in reverse order! 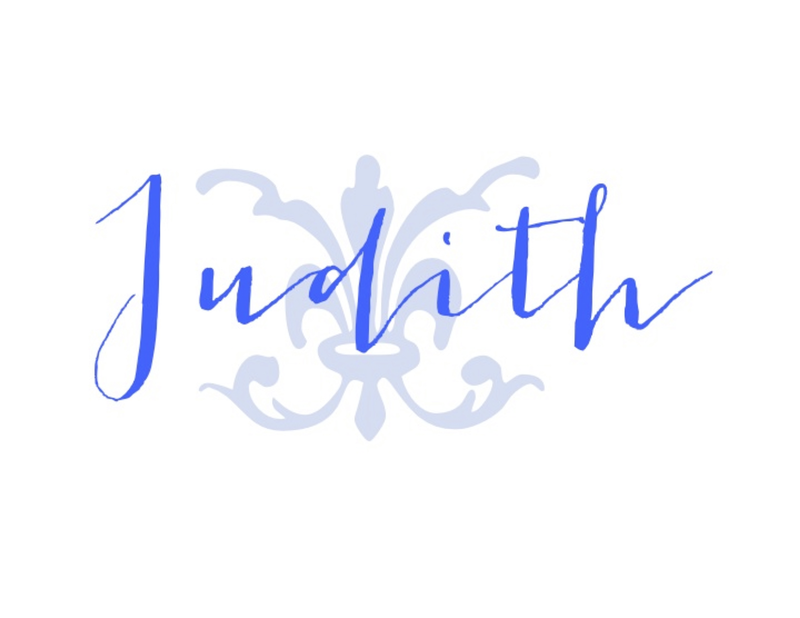 Lovely, Judith. I picked up some pumpkins last week, but haven't put something together yet. You are inspiring me! The bubble wrap was genius I'm going to have to remember that trick. Beautiful box and I love that shade of blue. Your blue box is GREAT! Can't find those everyday! Thanks for the tutorial and inspiration. Very beautiful! The blue box is perfect! Thank you for the tutorial. It is very detailed and will be helpful! 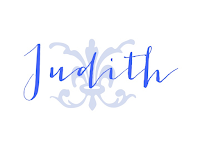 Judith, this is absolutely gorgeous! Thank you so much for the wonderful tutorial! I hope that you have a happy and blessed day!!! Love the box and the arrangement! Also, great tip about photographing in reverse order. 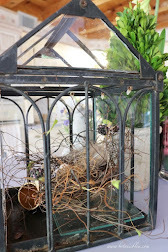 Judith I love all of the natural elements that you have incorporated into the box to make it so warm and cozy. So festive & fun! Love it! Thank you for this great tutorial. I am utterly hopeless when it comes to flower arranging. This is so helpful. Judith, your rustic box looks so perfectly arranged. Thanks for all your tips! Great tutorial Judith!!! Floral arranging is an art that you have mastered!! Thanks for sharing with us TaDa Thursday! !